A woman at home in Liverpool is disturbed by a persistent tapping at her back door. She’s disturbed to discover the culprit is a raven, and tries to shoo it away. Which is when the killer strikes. As flashbacks from his past begin to intrude, Cody realises he is battling not just a murderer, but his own inner demons too. 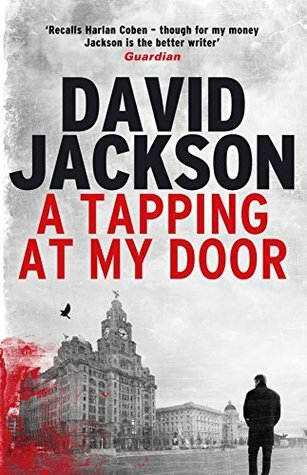 Following the success and acclaim of the Callum Doyle novels, A Tapping at My Door is the first instalment of David Jackson’s new Nathan Cody series. I am a massive fan of Jackson’s novels as you can see from my previous reviews, following the whole Callum Doyle series with Cry Baby, Marked, The Helper and Pariah, as well as listing him a Top 5 of the year post! The new series starting with A Tapping at my Door does not disappoint. Again, as I have done in the past with some authors, I will make a disclaimer, in that Dave is a friend, so take my thoughts on this as you will. Though my enthusiasm for his work can not be ramped up to the level it’s at, by friendship alone. Fantastic storytelling is what does that. A Tapping at my door is a new series set in Liverpool with new boy on the block, DS Nathan Cody. Cody has some pretty horrific personal demons to deal with as well as a sadistic killer to catch. It makes for a brilliantly layered and well-constructed read. This book doesn’t lie within the police procedural genre, though it is a team of officers investigating the murders, Jackson focuses more on the narrative than any procedure. He focuses on the people and their stories rather than what they are doing in their minutia of police work. Great big chunks of police work are skipped over in a sentence or two, just so you know that the work is being done. This is no way detracts from the story, because the story is about the killer, about Cody and a couple of other characters, about relationships, about the why. Not only do the police come under attack from the killer in A Tapping at my Door but there is an element where they are looked at for how they behave, it’s a strand of the investigation that has to be looked into because of the history of one of the officers murdered. This element of the book is sensitively done, but it doesn’t hide away, it manages to make both sides of the argument get their point across evenly and validly so that it’s heartfelt and for the reader you feel the raw emotion. This was a tough read for me in this way. At times in reading this book, I was sucked in and had tears in my eyes and a lump in my throat. Mr Jackson, if you read this, I’m sure you’ll know which part of the book I mean. At other points, I just couldn’t turn the pages fast enough. Jackson’s writing is flawless. Clear and concise. To the point and cuts you when you’re not looking. Utterly utterly fabulous. What a way to start a series! Highly recommended. Character-driven stories like this one can really draw you in and keep you riveted, Rebecca. And it sounds like an interesting plot, too. Glad you enjoyed it so well.